LONDON--(BUSINESS WIRE)--SpendEdge, a well-known procurement intelligence solution provider, has announced the completion of their latest category management study for an MRO service provider. MRO supply companies offer a multitude of products and services that are crucial for day-to-day operations. However, due to the large decentralized user base and millions of items and transactions, their MRO supply category has a higher chance of spend leakage. They need to identify opportunities and prioritize initiatives to determine all the sources available for spend optimization across all departments and business units to gauge the growing the market opportunities. They require efficient MRO supply models that can drive compliance throughout the organization and ensure spend efficiency through continuous monthly audits, post-implementation. According to the procurement experts at SpendEdge, “It is crucial for MRO supply companies to leverage spend analysis solutions across different supply chain categories and identify the tail spend opportunities to minimize spend leakage and achieve savings." The Business Problem: The client is one of the leading MRO service providers in the United States and ranks among the top ten in the world. They offer services such as upgrades, modifications, maintenance inspections, and refurbishments for a wide range of aircraft OEM platforms. Enormous growth due to advanced technologies, consolidations, and emerging markets opportunities caused continuous disruptions in the MRO supply chain, which resulted in major losses. This compelled the client to leverage SpendEdge's expertise and devise strategies to navigate the market landscape, ensure business continuity, and position themselves competitively. Managing materials and labor costs in the face of tightening MRO supply chain functions is a challenging task for companies. Talk to our experts and know how to gain control over demand planning and inventory management by incorporating the industry’s best practices. The Solution Offered: The category management experts at SpendEdge helped the client to address the MRO supply chain challenges. They adopted a comprehensive four-step approach that enhanced the efficiency of the MRO supply chain by over 60%. The approach offered by category management experts empowered the client to gain better visibility into the MRO spend and identified savings opportunities present within the MRO supply chain. 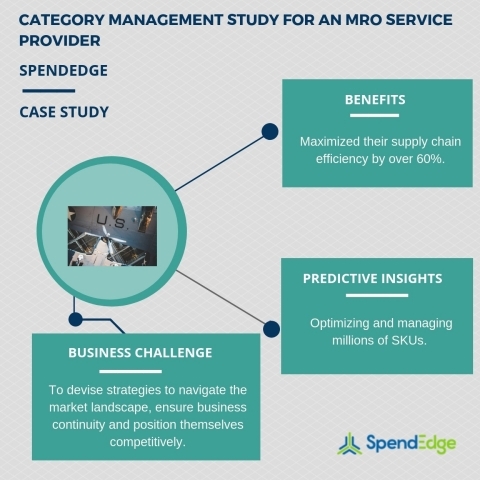 Apart from devising competitive MRO pricing strategies, SpendEdge’s category management process enabled the client to maximize savings through supplier consolidation. They were also able to streamline centralized billing processes to minimize administrative and MRO supply costs. Moreover, the category management process helped the client to optimize and manage millions of SKUs, itemize current price points across all facilities, and drive compliance throughout the organization. Many MRO companies are forced to make spot buys on a daily basis, which makes it challenging to effectively manage spend. To evaluate and optimize the current MRO supply chain, Request a free proposal today! Maximize their supply chain efficiency by over 60%. Ensure spend efficiency through continuous monthly auditing services, post-implementation. Does your MRO spend consume more than 3% to 10% of the overall procurement budget? Request a free demo and know how our category management process can better spend visibility across the MRO supply chain and improve spend management capabilities. Optimizing and managing millions of SKUs. Incorporating best industry practices such as vendor managed inventory (VMI), inventory consignment, industrial vending, and order point optimization. SpendEdge has announced the completion of their latest category management study for an MRO service provider.